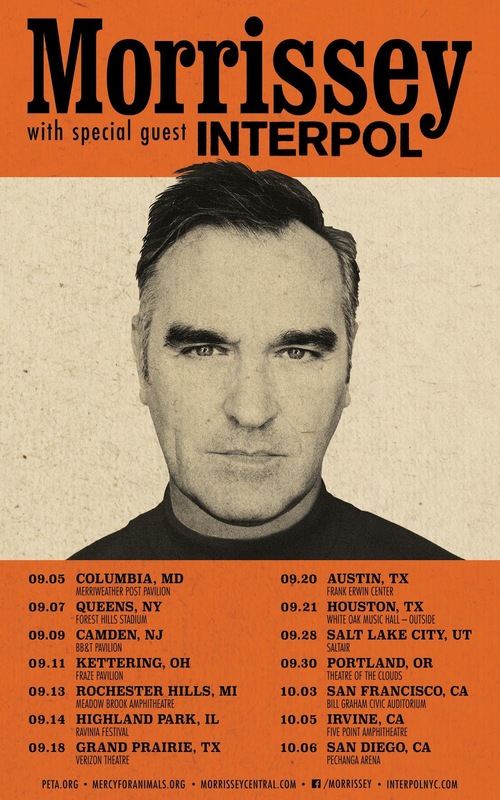 Morrissey is hitting the road in the U.S. this fall with Interpol serving as tour support. The 14 date tour includes a Detroit area stop at Meadow Brook Amphitheatre on September 13th. The general onsale for tickets is Friday, April 12th at 10am. Pre-sales kick off tomorrow (April 10th) at 10am. 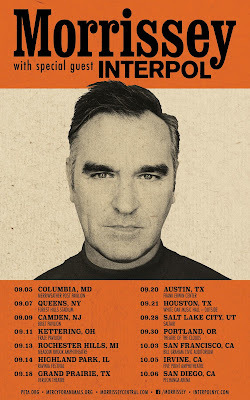 Next week Morrissey kicks off a pretty busy schedule of launch events for his new album California Son. On April 15th he heads to Canada for his first set of dates there in almost 20 years. From there he pivots to Broadway for his seven date residency at Lunt-Fontanne Theatre May 2nd through the 11th. California Son features 12 cover songs and arrives on May 24th. To date he's premiered three songs off the record including "Wedding Bell Blues," which he debuted yesterday. Pre-order here. Meanwhile, Interpol are set to release a five song EP titled A Fine Mess on May 17th. Pre-order here.